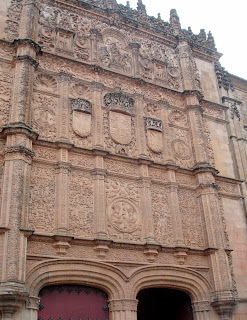 We picked up a rental car in Madrid and headed west to Salamanca. 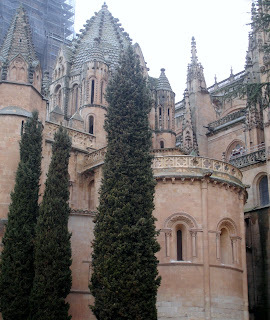 We weren’t sure Salamanca was worth an overnight stop. Were we ever wrong! It’s worth a minimum of two nights and I could happily have spent a week there. We had the misfortune to have gray, drizzly weather in Salamanca but the old town with its perfectly preserved Medieval and Renaissance architecture was spectacularly beautiful despite the gloom. We decided that if the weather was good on our way back, we would stop again to see that golden stone in bright sunlight. The rain did have one upside. The cathedral, the University buildings, and the Plaza Mayor were all brilliantly lit at night and the rain on the cobblestone streets reflected all that light, making Salamanca at night one of the the most beautiful cities I’ve ever seen. The Hotel we stayed in, Hotel Rector, could not have been more charming—all Rick’s internet research really paid off. Unfortunately when we drove by Salamanca on our return to Madrid, it was another gray day, but the town is so beautiful it didn’t really matter. This time we managed to see the University of Salamanca, founded in 1215. When we were there a week earlier we arrived at 1:30 just as the doors were closing. It would have been a real loss not to have seen the interior of the university. Apparently, medieval Salamanca had its problems with campus violence and according to the guide provided by the university, Alfonso X El Sabio, King of Castille 1252-84, “banned students from buying weapons and advised the university proctor to “imprison or expel quarrelsome students.” It was difficult to imagine warring students disrupting the tranquility of that serenely beautiful place.